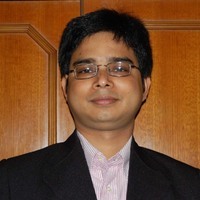 Dr. Sasanka Deka is an Assistant Professor and joined the Department in June, 2010. He received his M.Sc. in Chemistry from Gauhati University, Guwahati in 2001 and Ph.D. degree from National Chemical Laboratory (NCL-Pune) in 2007. He has been awarded the TMS Foundation 2008 SHRI RAM ARORA AWARD, by the Minerals, Metals & Materials Society (TMS), Warrendale, USA for his contribution and leadership in materials science. He then moved to National Nanotechnology Laboratory (NNL), CNR-INFM, Lecce, Italy and Italian Institute of Technology (IIT), Genova, Italy for postdoctoral research in the nanochemistry research group of Dr. Liberato Manna. Dr. Deka has published more than 50 research papers in different international peer-reviewed journals and meetings, and also wrote 2 books and 1 book chapter published by international publisher. He has been awarded with DAE-BRNS Young scientist research award. His current research interest deals with synthetic nanochemistry, multifunctional hybrid nanocrystals, novel nanomaterials for energy conversion and energy storage applications.